Firmament. Needlepoint on tight weave hessian – various wools and silks. Hi, only just found your blog and seen your lovely work. Please could you tell me which sort of fabric, thread to buy to have a go at this kind of tapestry? It looks almost velvety in some of the pictures. Hi Alana, thanks very much for your comment. This particular piece is worked on a fairly tight weave hessian/burlap – very cheap and cheerful stuff – actually offcuts from upholstery canvas – but really, you can use anything with a loose weave. These days, I mostly use linen scrim as my canvas, or cotton crash. The only thing I should make clear though, is that using loose-weave canvases will drive you mad if you like straight lines – however hard you try, the pieces go wonky. Now I like that, but I know it puts some people off. 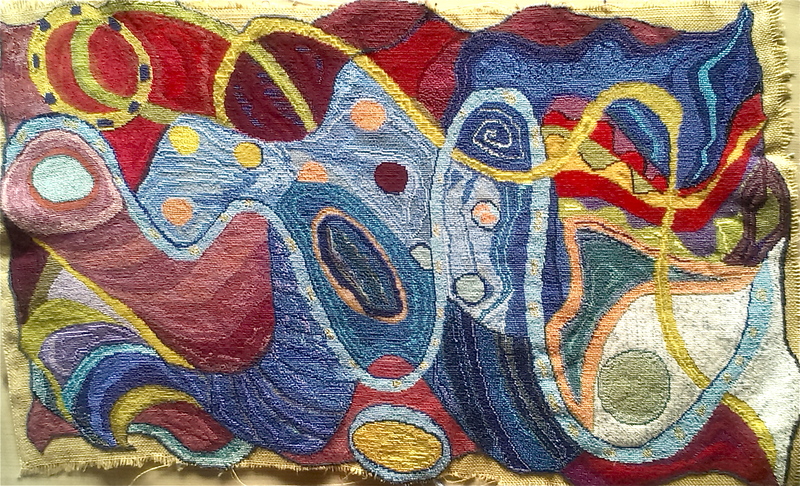 As for threads – this piece is mainly worked in woollen tapestry yarn, although there are also pieces of knitting 4ply wool and a few embroidery silks too. I love experimenting with different types of yarn, so I’ll use anything that gives me the texture or colour I want. My advice to anyone wanting to stitch like this, is just do it – don’t worry about the materials, use what you have. The process of stitching, the rhythmic passing backwards and forwards of the needle, is what gives me – and many other stitchers – the greatest pleasure, and eventually you’ll find which fabrics and yarns you like most. Thank you. Can’t wait to get started! But do you just make up a design and draw it or work from printed design? Sorry….just learning! Don’t apologise, I’m delighted to help! The way I work is usually to use a felt tip pen (something you don’t mind ruining) or similar and I just mark out a few lines – sometimes it looks like a doodle. Then I just start stitching and see where it goes. I know that probably sounds a bit daft, but it works for me. If you’re not sure what to do when you start and don’t feel like doodling, try doing something like my Hazey piece (it’s the first one on the gallery). All you do there is stitch a rectangle or square, then go round it with a different colour, and then perhaps overlap another different sized box, fill in, change colours, whatever feels right. There was no plan for that one, it just grew from a box. You’ll very quickly find out what you like doing. For the first few pieces you do, don’t go too big. They take quite a long time and the early days can feel a bit daunting, just stick with it and suddenly you’ll find it’s looking good and is nearly finished! Hi Anny, me again. As a start I tried a few stitches on some very loose weave hessian which we somehow had a roll of in the barn! I have no idea where it came from! It didn’t work for me at all as stitches just went everywhere and I’ve never tried tapestry before. Then I went out on Friday and bought a tapestry kit (small one) in the hope that the stiff fabric would help but I feel very uninspired by following the printed outlines. Where is the best place to get linen scrim or cotton crash? I can see that the tighter weave tapestries are much more appealing to me and I really want to create something like that! Thanks for listening this far!